Move your feet to the beat when you gather 'round with Bear and his friends in the Big Blue House for three dance-tastic episodes that encourage creativity, individuality and boost your child's self-confidence! In "Music To My Ears", everybody uses their voices and instruments to create Ojo's special orchestra, while Treelo shows everyone how to dip and twirl in 'Dance Fever". Then, the band helps Bear reclaim his cha-cha-cha in 'I For-.. Discover a world of differences with Bear and his friends in engaging musical episodes that teach tolerance, acceptance of others, and the value of charity! See what colorful fun opposites can bring at the Big Blue House in "As Different As Day And Night." Then meet a new friend, Benny the bat, and find out how being different can be good. At "The Yard Sale," Doc Hogg leads the gang in raising funds for the muskrats' charity, as they wo..
Join Bear and friends for a day of discovery in three episodes that reinforce independence, teach basic bathroom skills and give your child a sense of accomlishment. Going to the bathroom by yourself is a big part of growing up in "When You've Got To Go", and sometimes practice is the key to doing new things well in "If At First You Don't Succeed". Finally, night time is the right time to look back at all you've accomplished and "Call I..
Get in shape with Bear and his buddies in three colourful tales, featuring four sing-along songs - while teaching pattern recognition, listening and creative self-expression! Prepare to be dazzled when Bear's friends turn his red wagon into a true work-of-art in "A Wagon Of A Different Colour". Have fun with Ojo, Pip & Pop as they watch their world take shape in "Shape Of A Bear", and "Listen Up" with Bear for the sounds of the great ou..
Snuggle up with Bear and his friends for some sleepy-time fun in three stories that reinforce the value of friendship, good dental hygiene, and the importance of a good night's sleep! 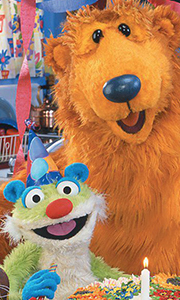 Ojo learns the importance of making new friends - and keeping the old - in "Friends For Life," then invites everyone over to the Big Blue House for "The Big Sleep." Wrap up your day at the Harvest Moon celebration, where Luna has a special surprise for Bea..